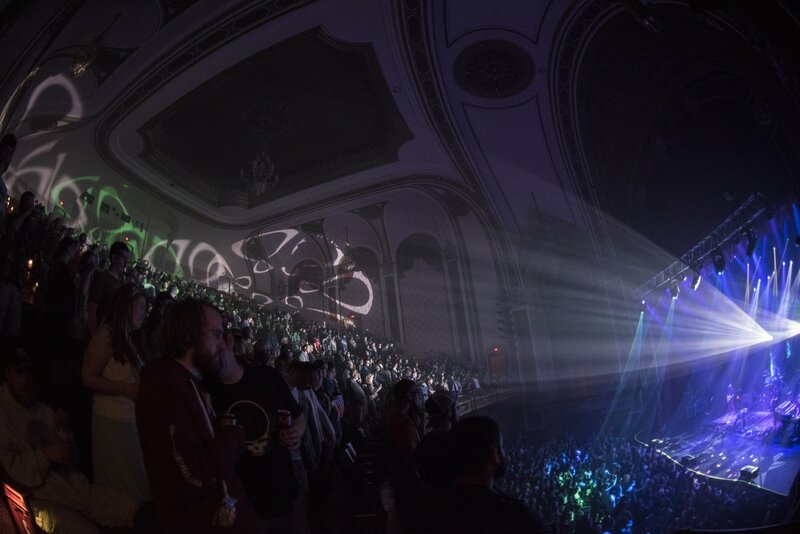 It’s always a highly anticipated treat when Umphrey’s McGee comes to town for a 3 night run! This being night one we knew that we were in for some madness. But before said madness would begin we were treated to an impressive opening set by Earphorik, the only opening act of the weekend. 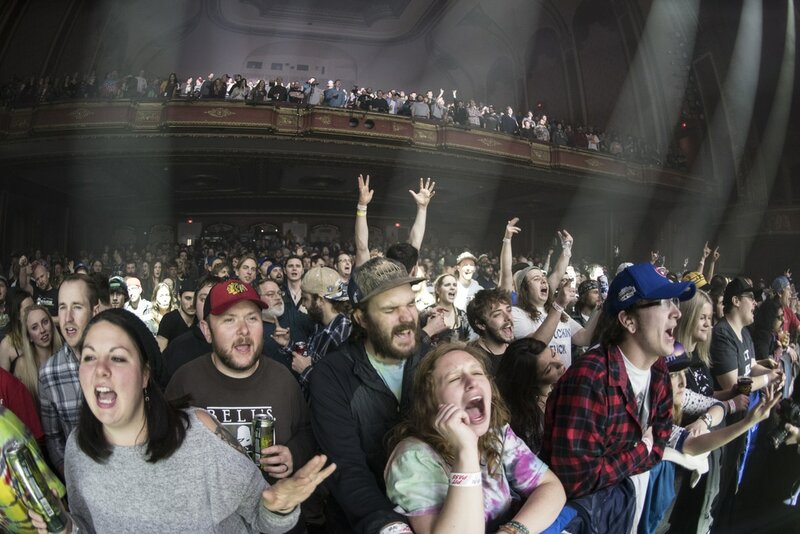 Their progressive sound paired nicely with Umphrey’s McGee who would also focus primarily on their prog sound throughout the night. 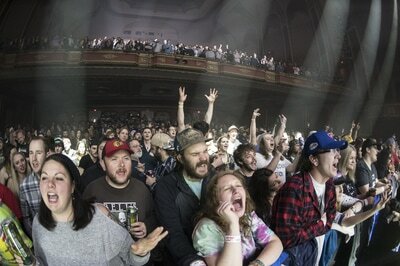 Umphreaks were ready to get started and the band was right there with them. They came out ready to get down with a brief “October Rain” that led into “Phil’s Farm” exemplifying their uncanny ability to tempo shift while remaining tight as a whole. Brendan Bayliss (Guitar, Vocals) and Jake Cinninger (Guitar, Vocals) trade licks but Joel Cummins (Keyboards, Vocals) was eager to be heard and went nuts on those ivories. All the while Jeff Waful (Lighting Director) added such amazing texture with his lighting, impressing fans as he always does. “Phil’s Farm”, being an extended jam, flowed between elements of prog, which would certainly define the sound of the evening, and funk with all sorts of variances in between. The transition from prog to funk was smooth and Joel added in some elements of 80’s synth pop while Ryan Stasik (Bass) provided thick and funky bass lines. But no matter how impressive any of the other members were Cinninger kept coming out on top noodling and picking with clarity and speed. 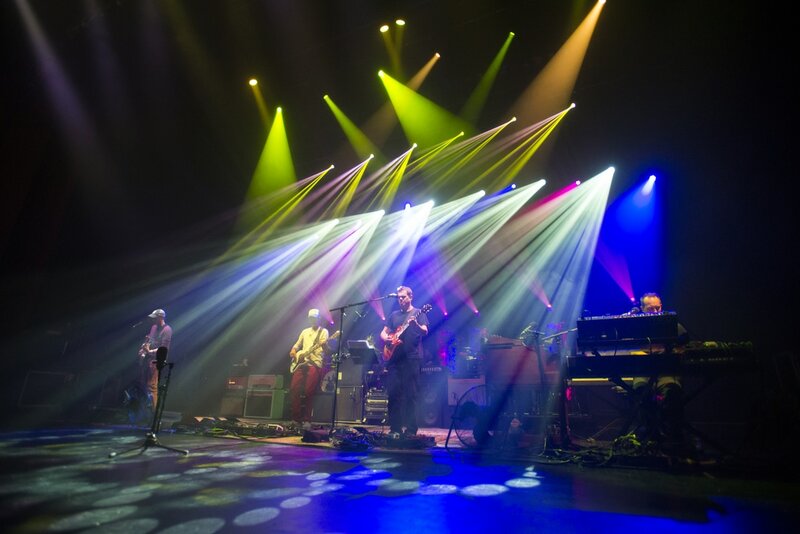 Much of the night felt like a jam session with the boys that was what I would coin ‘beautifully incoherent’, especially if you were not familiar with Umphrey’s McGee’s music. “Phil’s Farm” had so many transitions, tempo shifts and arrangement variations that I’m not sure if many knew that we were still on the same song! Regardless of all of that verbiage it was a fantastic way to start the evening and the fans went wild for it. A short break led into “No Diablo” which had a nice build up and exemplified the lighter side of Umphrey’s. This was a short but sweet tune that got anthemic during it’s brief duration. ​Temporarily downshifting a bit more Cinninger busted out the classic “Glory,” another song that really builds up as it moves along. Again it’s Cinninger’s lightning fast picking that had my ear despite the fact that the entire band was on point. Waful’s choice of color provided a tropical feel that accentuated the groove which had shifted into a deep, tribal and psychedelic feel helped along by Andy Farag’s percussion. Dual drummers is always a gigantic YES in my opinion and the interplay between Kris Myers (Drums, Vocals) and Andy Farag (Percussion) was one of the subtle yet defining aspects of their sound throughout evening. Cinninger and Bayliss picked up the pace to finish “Glory” off gloriously. Next up was “2x2”, another extended jam that, like the previous 2 songs, began with a slowed down tempo that built up to a very satisfying crescendo before Brendan stepped into the vocals. More impressive proggy tempo shifts characterised this song again with Cinninger going nutty and trading licks with Bayliss. Myers and Farag kept the beat moving along nicely. ​The entire band seems to be of one mind they are so tight, constantly reinforcing each other’s sound. And then there’s Waful who paints the backdrop so perfectly throughout. Fans were again pleased. Cummins started the next one with “North Route,” while Waful created a psychedelic backdrop. It wasn’t long before Cinninger and Bayliss got into the shred. The band kept it weird with Cinninger being the highlight as he picked his way through to the close of this song. “Blue Echo” started out with Cummins, Bayliss and Cinninger passing the groove off to one another with short licks. The piano came out on top throughout this one as Cinninger took a seat and joined Cummins on the keyboards. Cummins kept the groove mellow and dreamy. Cinninger played a tasty repetitive riff on the keys. 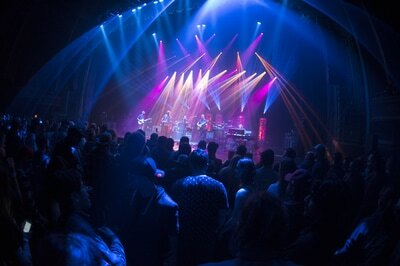 Bayliss kept the shred while Stasik provided a deep groove. I loved the interplay between Cummins and Cinninger on this one. Waful’s light work impressed with so many heavily saturated colors. The columns in the back were a visual treat as they illuminated various colors. Another tempo shift at the end of the song led into “Booth Love,” with more impressively tight picking by Cinninger. This one started off with a mellow groove that ended up getting uber funky. The vocals on this track are so beautiful, accompanied by that solid groove and Waful’s precise light work. This was a highlight for me. As the song progressed it became deliciously funkadelic. The percussion combined with those funky guitar riffs and Stasik’s consistently groovy bass line made for one hell of a fun song. Cummins worked that synth with a classic funk feel. Myers and Farag pounded those drums and garnered much applause. The first set came to a close at this point. Tight shredding, tribal beats and impressive band interplay kept fans enthralled. Set two started out with an extended “Der Bluten Kat.” An appropriate amount of mayhem between choruses would be how I described this one. This is another song characterized by numerous tempo shifts with band members passing the groove to one another. Cummins had my ear on and off throughout this number along with the ever consistent percussion. Bayliss teased a classical song that I couldn’t quite place before they slowed it down a bit with more deep bass lines accentuated by Cinninger’s tight picking. Waful’s dark lighting was befitting for this piece and commanded attention. His ability to play the lights to the music is top notch, especially for a band with so many tempo changes. Each member of this band, including Waful, are incredibly in sync with each other and are able to jet out to the forefront and sink back into the mix with total ease. What a wild ride that song was! “In the Black” was up next. Brendan nailed the vocals while he and Joel harmonized. Cinninger continued to be a force to be reckoned with. The man was all over the place and off the hook but in a great kind of way. He was on fire. Some hilarious stage banter provided a bit of a breather before Bayliss and Cinninger began to shred on “Hurt Bird Bath.” Here we had more unreal lightwork from Waful as he demonstrated an eery ability to sync up perfectly with Cinninger’s picking. Myers and Farag kept up a tribal beat that the band played well to. Cinninger and Bayliss picked up the tempo to build it up before tearing it down. Cummins synthed out nicely at this point to help close out this tune with a climactic conclusion. An almost surreal smooth and spacey transition led into “Upward.” Cinninger kept it real tight and energetic, even with the slowdown of this anthemic song. Slowing it down the boys transitioned back into “Hurt Bird Bath” with beautiful precision from Cinninger accompanied by consistent percussion. The trade offs here between Bayliss and Cinninger were some of the best of the evening. Cummins came back out with his synth wailing wonderfully which had my ear for the remainder of this song. This was another highlight for me. The way these guys can switch tempos so frequently while remaining so tight is just mind boggling. That percussion… My oh my. The crowd went wild after this one. Another breather opened the way to a reggae themed “FF” which added some nice spice to the overall progressive feel of the evening. Joel brought the island to life with his organ work. A slowdown was followed by another beautiful build up with some legendary trade offs between Bayliss and Cinninger. You could tell that they knew they had to close this one out but didn’t want to. An extended “Utopian Fir” came up next. Waful was fully in sync as usual. Kris Myers really shone through on this one as he busted out some beats that led Cinninger to feel the funk to stellar effect. The band really came together on this one, so tight in their turn taking. It was literally mind blowing. Cinninger’s extended noodling was extraordinary. The man was on a roll! So funky... Percussion then took over and holy moly! The band went dark for a bit but then dropped back into a reggae beat courtesy of Cummins and Stasik. Cinninger laid down a sensual groove to accompany the beat and then went no holds barred but with proper outcome. It all came together in a calculated mayhem with a big finish. A quick transition led back into a brief and fast paced “Der Bluten Kat.” Here we had more tasty trade offs between bandmates with heavy licks from Cinninger and a thunderous beat from Myers. 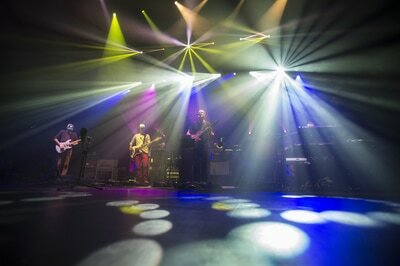 A hypnotic climax was accentuated by Waful’s eye grabbing light direction to close out the set.